Hi guys! I'm so excited to be able to announce another GIVEAWAY I am hosting in celebration of reaching my 50,000 Subscriber milestone on YouTube,! This time, I partnered with Calphalon and Jessie Steele to sponsor this giveaway for a totally awesome prize pack that I know you will just love as much as I do! 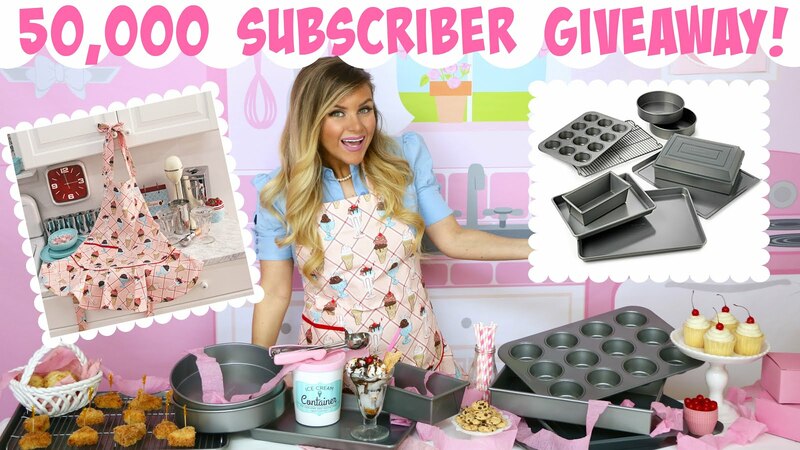 **COMMENT** on my giveaway video on youtube, letting me know what kind of recipes you want to see next! **FOLLOW** me on Instagram @LindsayAnnBakes & **TAG** a friend in my giveaway photo, who would also love this giveaway! The newest print in the most popular apron style! The Cherry Sundaes Josephine Apron features vintage inspired ice cream cones and sundaes (with a cherry on top of course!) With its signature ruffle hem, this Josephine apron is flirty and feminine with cherry red trims and adjustable ties at the waist and neck. Winners will be chosen once the giveaway is over and announced here on the blog, in addition to being notified via the email linked to the entry. Winner will have 48 hours to respond and claim their prize. If you didn't win this time, be sure to stay tuned for more fun giveaways and don't forget to subscribe to my my youtube channel, where I will be sharing all-new recipes and more!